The last week of 2018 was a bit slower than most, but this didn't stop the news cycle completely, as Thailand became the first country in Southeast Asia to legalize marijuana for medicinal and research purposes, and the Israeli Parliament passed a law allowing for medical cannabis exports. On the markets front, the biggest news item was on Aphria Inc (NYSE: APHA), which received an all-stock hostile takeover bid from Xanthic Biopharma Inc (OTC: GGBXF) (doing business as Green Growth Brands) valued at $2.1 billion. Timing is also interesting in Eneman’s view, due to recent allegations against Aphria and the resulting share price fluctuations. Over the last five trading days, the United States Marijuana Index, which tracks most of the largest marijuana stocks in the U.S., lost roughly 1.6 percent, while the North American Marijuana Index, which also includes Canadian stocks, slipped approximately 1.4 percent. Over the same period – including last Friday, the Horizons Marijuana Life Sciences Index ETF (OTC: HMLSF) (TSE:HMMJ) gained 3.5 percent, while the ETFMG Alternative Harvest ETF (NYSE: MJ) rose roughly 4.2 percent of its value. The SPDR S&P 500 ETF Trust (NYSE: SPY) closed the week up 2.8 percent. MagicalButter donated 420 MagicalButter MB2e machines to medical cannabis patients in Puerto Rico during the 2018 Puerto Rico MedCann.Biz Conference, as part of the company’s annual Cheers to Goodness campaign. The Cheers To Goodness Foundation is a natural outgrowth of MB founder and CEO Garyn Angel’s impulse to give critically ill kids and military veterans a fighting chance and educate the world about the astonishing medical benefits of cannabis. “The first day of MedCannBiz brought in thousands of new medical cannabis patients—an innovative project that assembled 10 certified Puerto Rican physicians to provide onsite evaluations for MMJ recommendations. New patients left with their medical cannabis card in hand. MagicalButter was able to donate 420 MB2e machines to the new patients of Puerto Rico. The MedCannBiz Conference was a brilliant effort that we were honored to be a part of, greatly improving patients access,” said Garyn Angel, CEO of MagicalButter.com. Weekend Unlimited Inc. (CSE: YOLO) named Paul Chu to the role of President and CEO. Chu brings over 25 years of success across a variety of industries. He has co-founded and held leadership positions at companies in the cannabidiol (CBD) cannabis industry, including HEY MARY and Canna Candys. “I am optimistic about the prospects and opportunities of launching innovative high-quality products and services throughout our existing and new markets. Based on our successes to date, Weekend Unlimited has an unparalleled opportunity to create demand for a consumer-focused portfolio of recreational cannabis brands," said Chu. Green Thumb Industries was awarded a New Jersey license for cannabis cultivation and processing, as well as a dispensary. This marks GTI's first entry into the state. The company also received four retail dispensary licenses in Pennsylvania that will enable it to open 12 additional RISE stores. Direct Cannabis Network had the courtesy of sharing a video for our #PotStocksRecap. Watch CEO Adelia Carillo, co-host of Wonder Women of Weed, sit down with Troy Dayton of the Arcview Group and discuss cannabis investments. How stocks moved after the Food and Drug Administration suggested hemp-derived cannabidiol, or CBD, is mostly illegal. Oregon’s decision to allow medical marijuana deliveries. How a lot of cannabis stocks were upgraded to the OTCQX this year. KushCo Holdings Inc (OTC: KSHB)’s global ambitions. Goldleaf released The Cooking Journal, featuring blank templated recipe pages for both cannabis infusions and traditional cooking; a series of terpene flavor pairings by Jamie Evans, The Herb Somm; helpful dosing calculations to plan your dishes, and more. The Cooking Journal is designed to help you track your cannabis culinary adventures. With so many variables in the kitchen and the many varieties of cannabis available, small changes can make a big difference. The Cooking Journal helps dial-in your cannabis recipes and encourage stress-free kitchen experimentation. The journal also comes with a selection of recipe cards from some of the top cannabis chefs in the industry. "The Blue Dream is a savory, tart and easy drinking Cannabis Margarita that gets its beautiful hue from Spirulina. On it's own, Spirulina can have an off-putting taste, but inside of this cocktail, you get all the various nutrients and antioxidants that benefit your body and brain, in a delicious concoction. This way when we imbibe, we do it with great intention,” said Jason Eisner, Mixologist. 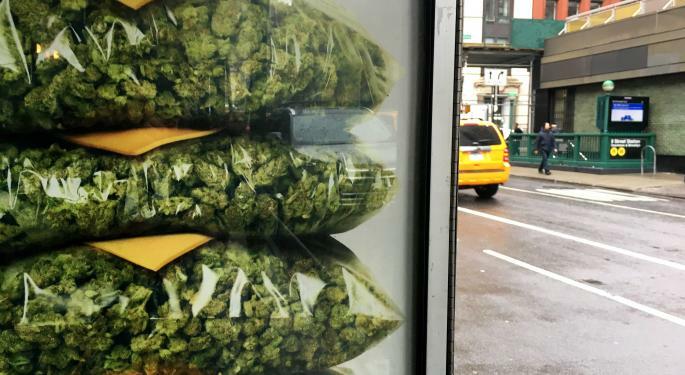 For the first time ever, a cannabis ad will appear on Times Square on New Year's Eve. Celebrating new opportunities born from the passage of the 2018 Farm Bill, Elixinol Global (OTC: ELLXF) subsidiary Elixinol will appear in multiple locations throughout Times Square. 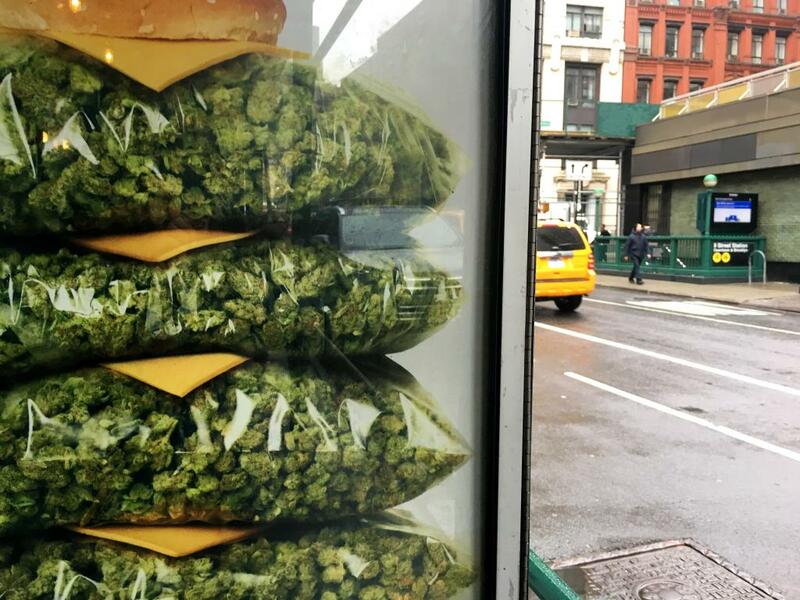 Elixinol is joining other cannabis brands in Times Square including Cannabis Network Media, Curved Papers, My Bud Vase, MTracTech, Restorative Botanicals. The placements will run between 5 p.m. and 2 a.m. in 15 second increments. Jan. 15-16: Benzinga will host its second Cannabis Capital Conference, this time on Miami Beach, Florida. This networking event for institutional capital and the leading cannabis companies will feature company presentations, panels and keynotes by Giadha Aguirre de Carcer, Danny Moses, Tim Seymour, Jon Najarian, Alan Brochstein and many others. Get tickets here.